Heartworm is a particularly dangerous parasite that can prove fatal in both dogs and cats. It can be very difficult to treat once established, so it is particularly important to include a heartworm preventative as part of your pet’s treatment routine. As heartworm is transmitted by biting insects such as mosquitoes, dogs and cats can become infected without coming into contact with other animals, even if they are indoor-only pets. 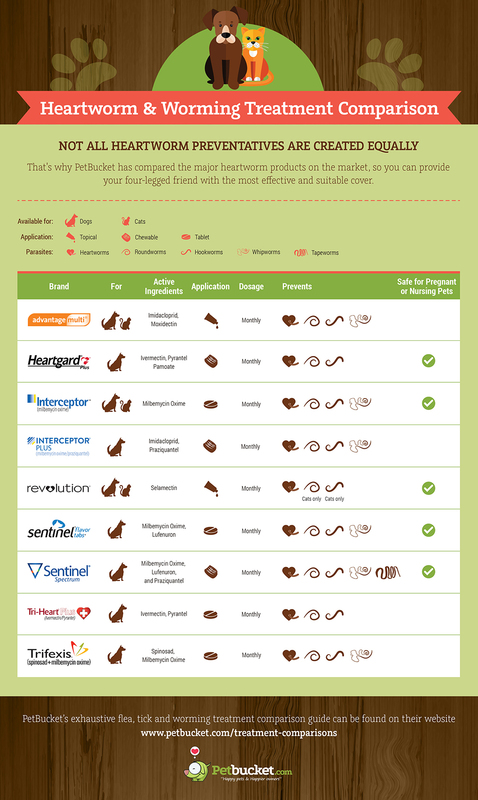 With the number of heartworm preventatives available, choosing the right treatment for your pet can be overwhelming. Some things you might want to consider is whether you are treating a dog or cat, whether you want a topical or oral treatment, and the active ingredients. Some heartworm medications also provide broad-spectrum treatment against other intestinal parasites such as roundworms, hookworms, whipworms and tapeworms. We’ve compared some of the major heartworm preventative treatments below to help make your options easier to understand.